The Lake Agnes tea house hike at Lake Louise is a great hike if you’re a bit short on time but still want some epic views. The view of Lake Louise from the Fairmont hotel. 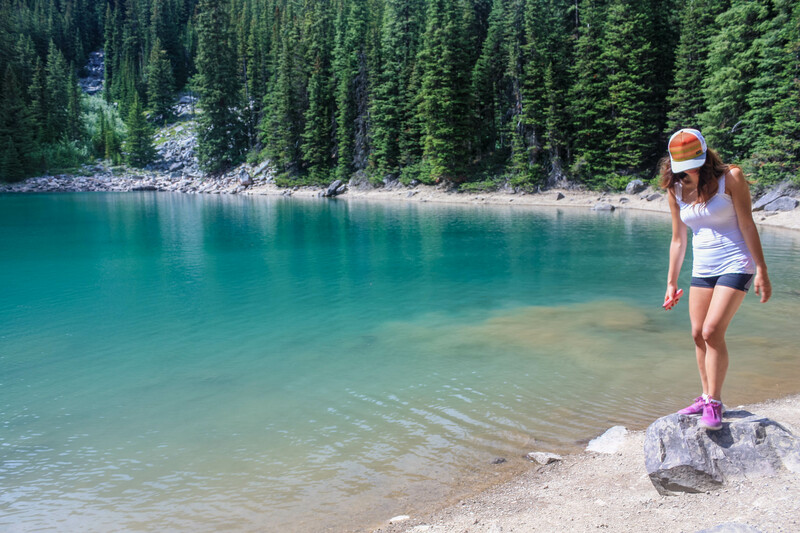 Arriving at Lake Louise, you’ll see the stunning pale blue lake stretching away from you. Unless you’ve arrived at sunrise, you’ll likely find yourself in a sea of tourists fighting to get their photos. If you’re anything like us, you’ll want to get away from the crowds as quickly as possible, and find something a little quieter and a little more unique. You’ll have to put in some hard work for that, but it’s worth it, we promise you. The Lake Agnes Tea House hike, followed by the hike up to the Big Beehive ( a rock, not an actual beehive) probably takes around 4 hours to the top if you’re very fit, and probably around 5-6 if you want to take it a bit slower. The whole trip is roughly a 10km round trip, and there is a total of around 510m elevation gain. From our point of view, the steepness of the trail means you spend less time hiking and more time checking out the amazing views, but it means the hike is pretty strenuous from start to finish. Starting in front of Lake Louise, you’ll want to head right and up into the trees. The thick forest may fool you into thinking you haven’t made much ground, but just wait until you catch a glimpse of the lake through the trees. You’ll be amazed at how quickly you’ve climbed. Keep pushing ahead and you’ll quickly find yourself at Mirror Lake. The first stopping point on this trail, 0.5km from the tea house. Mirror lake reflections in the morning. We’ve done this hike at lots of different times of day, and if you’re a keen photographer and are after a reflection shot, you’ll want to get here as early as possible. Once the sun is above the tree-line, you won’t get the amazing reflection shots but instead, the water will turn a beautiful deep green. Either way, it’s stunning. Another reason for attacking the hike early is to avoid the crowds. The condition of the path, the proximity to the Fairmont, and the teahouse at the top is the perfect storm for fair-weather hikers and tourists, so expect obstructions in your photos, and to be dodging tourists most of the way up. As with most things in life, it is very definitely a case of, “the early bird catches the worm” with this hike. From Mirror Lake, it’s a short way to Lake Agnes, and far less strenuous than the first part. Head upwards again and keep a watch for a look out point on the right hand side. You’ll have stunning views of the valley from here but, if you plan on doing the beehive hike, there are still better views to come! This part of the trail is shared with the horse track, so keep an eye out for horses! You’ll know you’re at the teahouse when you see a waterfall cascading into the lake below, and a wooden staircase. 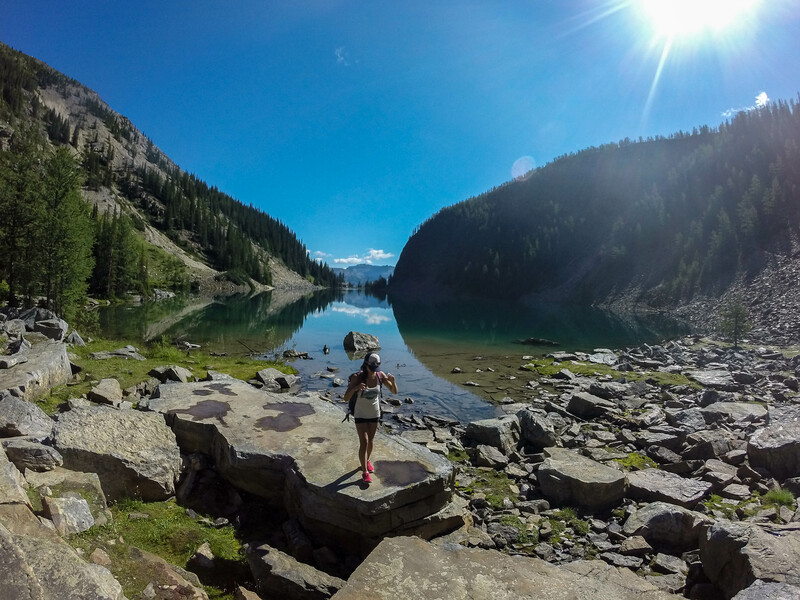 Congratulations, you’ve made it to the beautiful Lake Agnes! We like to take a break here and stop at the family owned teahouse for some scones with Jam and a lemonade, but it’s an equally good picnic spot. Bring cash if you want to grab something from the teahouse and expect to pay a little bit more than usual for food and drink, as supplies are carried up every day on foot! It can also take up to half an hour for the kettle to boil at that altitude, so patience is necessary here! There are some basic outhouses here as well, just a stone’s throw from the teahouse. If you don’t mind freezing water, this might be a good spot for a little dip as well! From first hand experience, we can tell you it’s not for the faint hearted. The temperature of the lakes stays fairly constant throughout the year and sits slightly above freezing. If time is of the essence, then this would be a good time to turn around and head back to Lake Louise. As 99% of tourists turn around at this point, the next part of the hike is significantly quieter and less traveled, so going a little bit further is definitely worth it! Next stop, the Big Beehive! From the Teahouse, follow the edge of the lake around to the right, and keep going until you reach the far left corner. The switchbacks start here, and again, these aren’t for the faint hearted, or those afraid of heights! Once you’re past the gruelling switchbacks, you’re almost there! 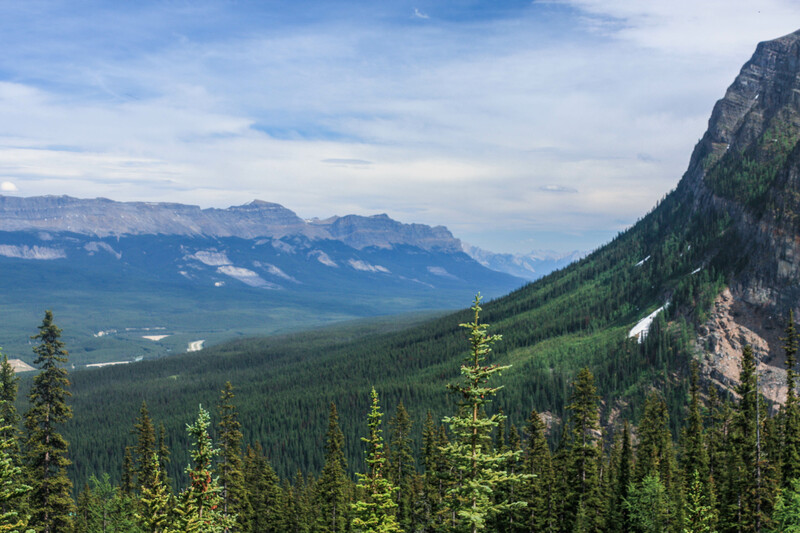 Just head left at the top towards the lookout over lake Louise, and prepare yourself to be greeted by some of the most stunning panoramic views in Banff National Park. The views from the big beehiveThe edge of the Big Beehive is quite precarious but the views are unbelievable. The spot is incredibly peaceful, and all of your aches and pains will drift away as you get lost in the views. Cast your eyes back to the shores of Lake Louise and count the camera flashes of all the tourists you left behind and you’ll know you made the right decision. 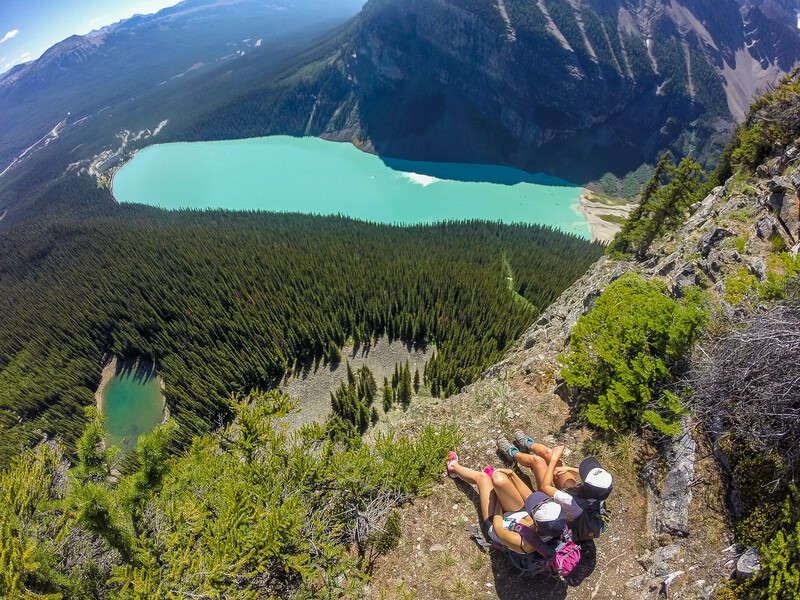 From here you can either continue on further, to the plains of the 6 Glaciers, scramble up to the Devil’s thumb for even more epic views, or start the hike back down to Lake Louise. The Big Beehive is one of the shortest hikes in the Canadian Rockies, with some of the most stunning views. We regularly take friends from out of town here and it’s the perfect hike if you have a few spare hours on a long summer day. Email Louise@eliteyyc.com for more details and trip planning.